New colours and designs for the Nora Signa Rubber Flooring ..
Bestseller in a new guise: With a revised design and colour spectrum as well as an additional surface structure. Since its launch in 2007, the rubber floor has impressed with its versatility in terms of accessories, colour and functional diversity. With around 16 million square metres sold, these properties have made it a global sales hit, having been installed in hospitals, schools and universities, in industrial enterprises, public buildings and rail vehicles from Shanghai to the USA, from Antwerp to Dubai. “Noraplan signa rubber flooring is an all-rounder for every purpose and the most successful product in the history of Nora systems,” says Dirk Oswald, head of product management at Nora systems. The reasons for the continued success are manifold. On the one hand, the variety of colours is appealing. With 48 colours to choose from, Noraplan signa offers the widest selection of all Nora rubbber flooring. On the other hand, the floor is also a functional all-rounder and supports the systems concept. For example, Noraplan signa is available with a dissipative surface, as tiles or as sheets and in different thicknesses (two and three millimeters). An option with particularly high footfall sound absorption is also part of the range. In addition to the variety of different technical and functional properties, the Noraplan signa product portfolio includes a suitable accessory program with joint sealing compound or skirtings for the perfect wall elevation. 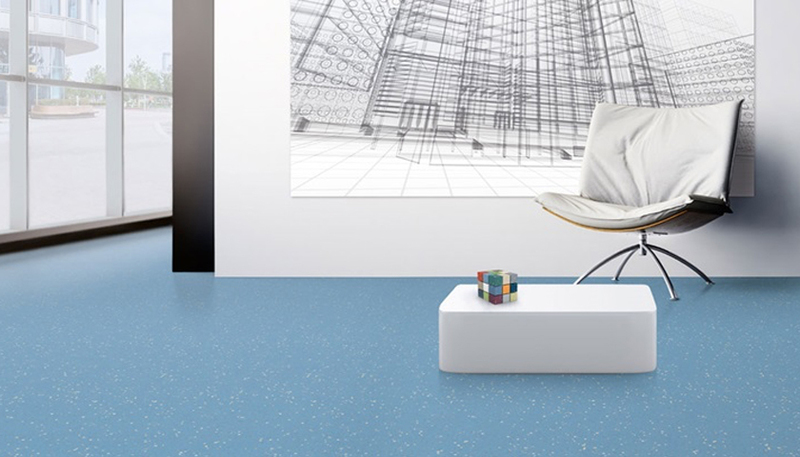 Furthermore, Noraplan signa is also available as a nTx variant, in which the adhesive is already attached to the underside of the floor covering, particuarly suitable for installing over existing floor coverings and screeds with high levels of residual moisture. A particularly anti-slip R10 variant with a reflection-breaking surface is completely new. “This product is available in one colour – but all other colors can be produced at any time with a certain minimum order quantity,” explains Oswald. In addition to the extra surface options, Noraplan signa’s colour spectrum and granular patterns have also been reworked. “When it came to the revisions, it was also important to us to create a harmonious design with consistently timeless colours so that an installed floor still looks attractive and modern after decades,” says Oswald. The granules of the new Noraplan signa are even more attuned to the respective base colour. The updated colours range from cool shades of grey and warm beige colours to vibrant tones that offer countless combinations and also create a pleasant room atmosphere across different areas from a single source. Like all nora floor coverings, Noraplan signa is particularly low-emission and thus ensures a healthy indoor air. The dense surface makes it particularly resistant and is easy to clean. As a result, the rubber floors are extremely economical and meet the highest standards of hygiene. Thanks to their excellent, lasting elasticity, they also offer optimal standing and walking comfort.